???????? ????? 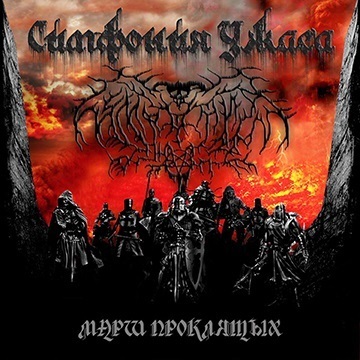 (Symphoniya Uzhasa) is the first metal band from Kazakhstan I’ve ever listened to. They were formed in the end of 2008, originating from Almaty, the largest city in Kazakhstan. The band’s name, which translates to Symphony of Horror, was chosen a few days before they start their live activity in the Spring of 2009. The band has undergone several line-up changes since then and finally in the end of August 2011 they began recording their first album as a 5-piece band. Soon they realized they needed a second keyboard player, so the line-up was completed with a new member. The recording process took them 16 months and their debut full-length album “???? ???????? ?” was finally released digitally on December 21st 2012. In the end of 2013 the album was also officially released on CD. “???? ???????? ?” is a very good and ambitious first work, especially if you consider that the band comes from a country with very small tradition in this music style. The album title means “March of the Damned” and it includes 11 tracks with a total duration over 47 minutes. ???????? ????? play a mixture of symphonic and melodic black metal with many interesting ideas. The use of 2 keyboards should already prepare you for the synth-based nature of their music. Indeed, synths have the basic melodic role in their music, used both as a background symphonic layer and as piano keyboard that plays many of their melodies, but it also leaves a lot of “space” to the guitars, which are quite dominant in their sound. So, except for the rhythmic guitar riffs, the band often uses melodic lead guitars and technical solos, away from the usual black metal standards. On the other hand, their vocals are the typical black metal screams, quite passionate and expressive. Their album has an interesting horror fantasy atmosphere, in harmony with the somehow old-school aesthetic of their sound and production. I’d like to mention here, that even if ???????? ???? ?’s music is very melodic, the band avoids using repeated refrains and catchy melodies, instead prefers a more generic “melodic aura” throughout the whole album, something that demands more time and attention from the listener. All of their lyrics are in Russian, dealing with dark epic fantasy themes, but they are absent from the CD booklet. I believe that fans of underground symphonic melodic black metal will appreciate the debut album of ???????? ???? ?, a very decent work of a promising new band. Of course they still need improvement, both in sound quality and songwriting, since while there are many great moments in the album, there are also several less interesting parts. Also, at least for my personal taste, some local elements in their music could help them make something more distinctive in this overcrowded genre. “???? ???????? ?” is self-released in a standard jewel-case edition CD, with 4-page booklet, printed in glossy photo paper. The only way to get the album is to contact the band directly, visiting their official pages below, where you can also listen to their music.